Gas monitoring equipment and gas leak detection equipment should be installed, because the health and safety of workers and the general public is a top priority. Industrial Safety Equipment, LLC's vast selection of monitors can quickly detect potential problems with gas vapors or airborne contaminants. Fixed gas leak detection systems, appropriate for each application, continuously monitors for particular types of gases, so you know if there is something wrong right away. These detectors come in various types for different gases, including ammonia, hydrogen sulfide, combustible gases, PIDs for volatile organic compounds and even industrial carbon dioxide detectors. 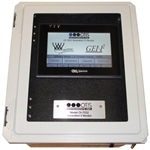 For ultimate convenience and easy installation, we also offer wire free fixed gas monitors.